This web site is mostly out of date. 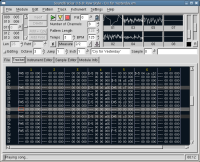 SoundTracker is a music tracking tool for Unix / X11 similar in design to the DOS program FastTracker and the Amiga legend ProTracker . Samples can be lined up on tracks and patterns which are then arranged to a song. Supported module formats are XM and MOD; the player code is the one from OpenCP. A basic sample recorder and editor is also included. SoundTracker is free ("open source") software, licensed under the GNU GPL. The name of the program is a tribute to Karsten Obarski, who released his Ultimate Soundtracker program for the Amiga in 1987 and thus unknowingly founded the basis of a huge free-music movement. The basic concept is very simple: you have a number of sound samples, and you can arrange them on so-called tracks. A track (also called "channel") can not play more than one sample at the same time. Whereas the original Amiga trackers only provided four tracks (this was the hardware limit), modern trackers can mix a virtually unlimited number of channels into one sound stream, applying various effects to the samples used. Tracks which are played at the same time are grouped to form a pattern. A pattern typically has 64 entries per track; these entries are cycled through at equidistant time intervals. A basic drum set could thus be arranged by putting a bass drum at entries 0, 4, 8, 12 etc. of one track and putting some hihat at entries 2, 6, 10, 14 etc. of a second track. Of course you can also interleave bass and hats on the same track, if the samples are short enough -- they can't overlap, otherwise the previous sample is stopped when the next one sets in -- look at the screen shots for a more visual explanation. Finally, a module is a compact file containing various patterns and samples, including a position list which specifies playback order of the patterns, forming a song. SoundTracker can load modules of the popular XM and MOD formats. The also very popular IT format is not supported at the moment. Page maintained by Michael Krause (rawstyle@soundtracker.org). The SoundTracker logo has been drawn by Martin Andersson a.k.a. Globber/Triclapse.